You may have heard of the current players in this space. BoxTone and ZENprise. They have been around for a long time and have established client bases of satisfied customers. However it is always good to bring up our heads and look around for a fresh approach, and a fresh approach is what STEALTHbits gives you. 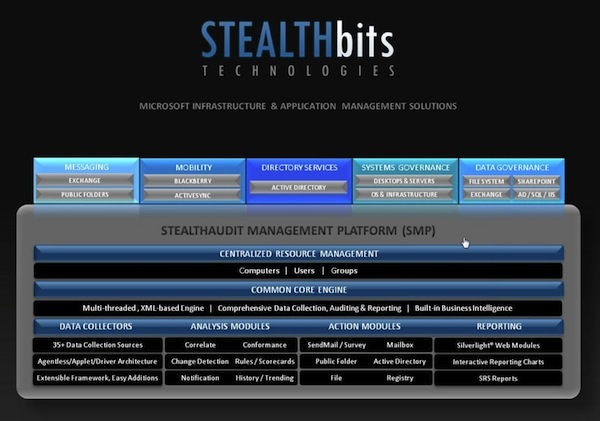 STEALTHbits started life as a company that monitored and reported on desktops and servers, but then progressed into monitoring and reporting on Active Directory, Exchange, SQL databases, and even SharePoint. By reporting and monitoring on all of these systems they can provide you with a near complete picture of what is going on in your environment. As we know, all environments consist of multiple servers and systems. Your Exchange server runs on a Windows server and both connect to Active Directory. If you monitor and report on all three, you can much more easily provide a complete picture of the environment than if you just monitored and reported on Exchange. 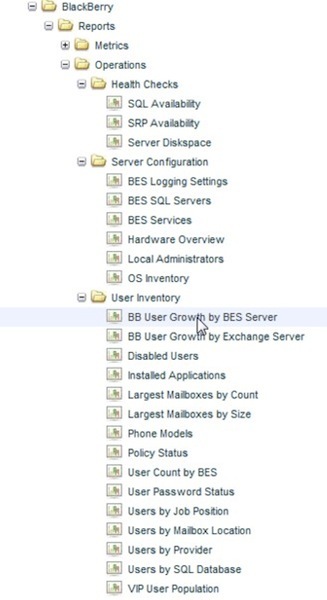 With that in mind, imagine if they added BlackBerry Enterprise Servers (BES) into the mix? Well they have. STEALTHbits does all of the monitoring you would expect like SRP status, Hung Threads, high pending counts, etc. However since it monitors the entire environment it can tell you much more than just the health of the BES and its users. It can tell you the health of the Windows server the BES is running on, the health of the Exchange server(s) that the BES communicates with, the health of the SQL server that holds the BES configuration database, and the health of Active Directory that all of them connect to. The BlackBerry Information Center provides a window into all of this collected data and monitored information. From this console you can see BES, user, and device information. Overall statistics can be drilled into to reveal extra information. For example, click on Users Out Of Coverage and you see who those users are. Even more impressive is the user information that you can see if you search for a user. Because STEALTHbits monitors Exchange this screen can show information like whether the user's mailbox is over its limit or not. You can click on the Exchange button to see what might be wrong with this user's Exchange. At the bottom of the screen we can see what applications the user has installed on their BlackBerry. If an Exchange server is down, this console will show you all of the BlackBerry users affected. 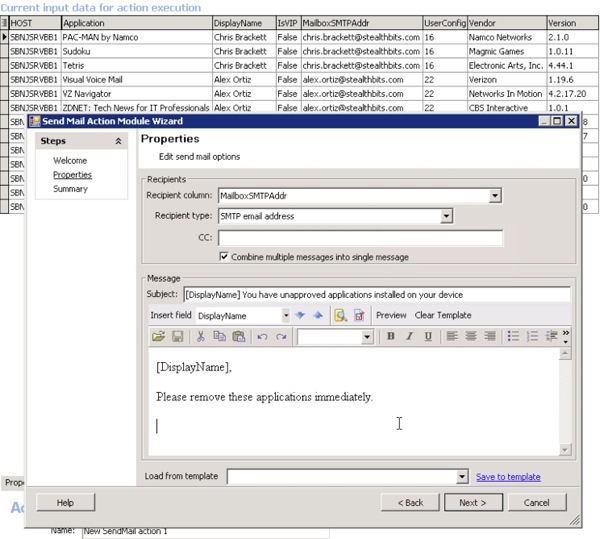 If you want to collect unique sets of information you can create new Data Collectors using the Data Collector Wizard. This wizard walks your through the steps of creating a Data Collector and allows you to drag and drop your elements in place. Once a new Data Collector has been created, you can see the information in the Information Center and in reports. In addition to monitor critical parts of your BlackBerry environment, STEALTHbits has a very extensive and flexible reporting system called the Report Index. While it comes pre-loaded with tons of different reports, you can create your own using their easy to use report wizard. These reports are useful to many different departments within your organization like asset management, billing, help desk, operations, and engineering. The historical information that can be seen also helps with root cause analysis in the event of an issue. As you can see, a lot of very useful information that all parts of the organization will be able to make use of. 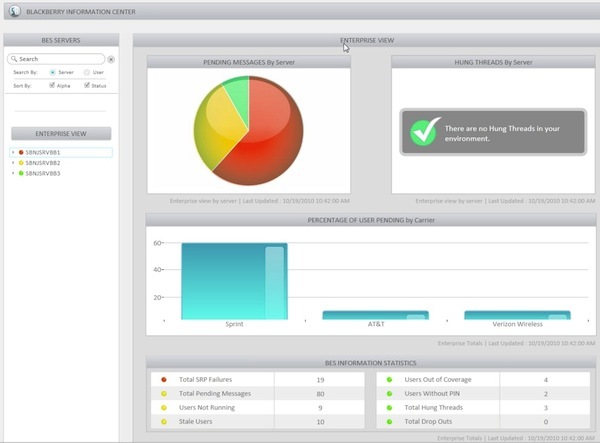 With many of the reports you can take actions associated with the reports. 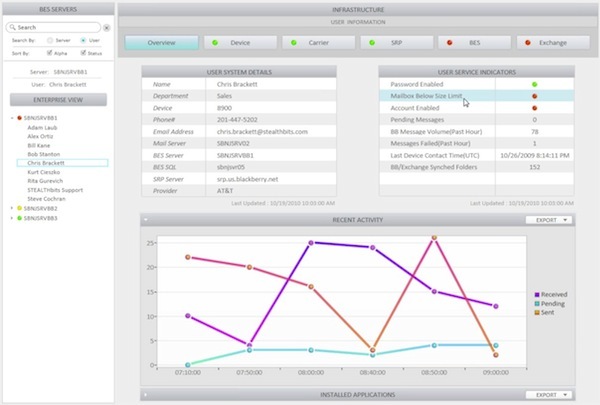 In this example we see a report of BlackBerry applications. Lets say we don't want people installing these and want to send them an email. The Action Wizard allows you to very quickly automate this process so that periodically offenders will receive a stern email asking them to remove those applications. Anything that can be found in logs or in the SQL database can be reported on, even call logs, SMS messages, and BlackBerry Messenger conversations (if that logging is enabled on the BES). While I have not personally used STEALTHbits, what I have seen impresses me a lot. It is the first time that a company has provided us the complete picture of our BlackBerry environment plus all the components that it communicates with like Exchange, Active Directory, and SQL. The interface is very polished and professional, the reporting mechanism is outstanding, and the data it reports on is extensive. If you run BES with Exchange, I highly recommend that you take a look at STEALTHbits.